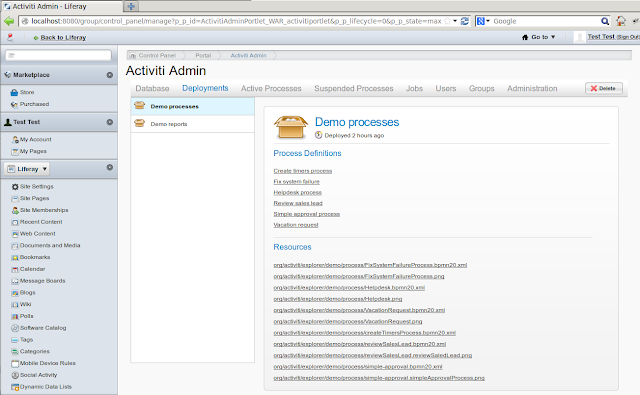 In the following blog post, I have highlighted the matter of embedding Activiti BPMS inside a Liferay Portal. With Activiti Explorer built in Vaadin and Spring, it is fairly easy to use entire components in a totally different environment. But, Activiti is "just" a BPMS - you can run your processes with it, maybe even connect to Active Directory, Alfresco or ESB - but if you want to embed it in your intranet/extranet portal, you are almost on your own. Please note, that embedding Activiti in portal is not the same as using it to manage portal assets - for example, as a replacement for Liferay's Kaleo Workflow. The matter discussed here is more focused on using all of Activiti features, including user interface. Luckily, this is when frameworks used in Activiti pay off - Activiti Explorer is written in Vaadin 6 and Spring. With component oriented approach from Spring and UI modularity encouraged by Vaadin, it is fairly easy to port this application to Liferay. We can extract entire components from Activiti Explorer (e.g. Tasks panel) and use them in a whole new environment. Extracting and re-using entire components requires much more work in a classical MVC approach and even may not always be possible. Also, portlet support in Vaadin makes a whole task much more pleasant. For the impatient: The code is available in my fork of Activiti 5.13-SNAPSHOT: http://github.com/tlipski/Activiti, especially in activiti-portlets module https://github.com/tlipski/Activiti/tree/master/modules/activiti-portlets. Navigation can be provided by portal - including friendly URLs, which makes for a more standard user experience. Distribution and management of Vaadin widgetset and version - we should use Vaadin Control Panel portlet and Liferay to manage Vaadin dependencies. This requires special handling, since Activiti Explorer 5.13 utilizes dCharts Vaadin Add-on. 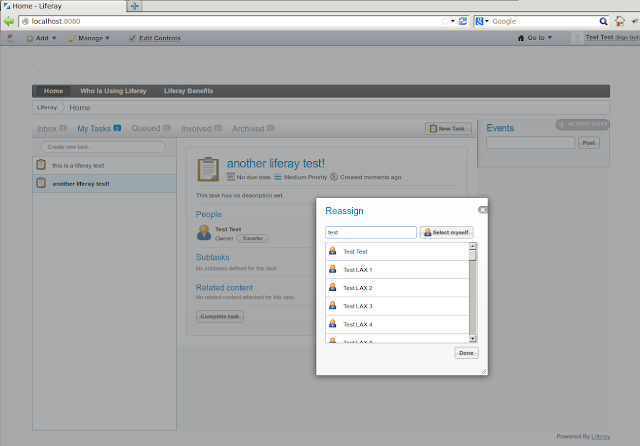 Vaadin theme used in portlets - which is also customized by Activiti, but should be coherent with portal's look & feel. Activiti Tasks portlet, which works in a user's context as if the user would log in to Activiti Explorer app. The portlet provides full functionality, including operations as starting a new task, fetching it from a task list, displaying task's events, assignment/ownership transfers, file attachments and so on. Activiti Admin portlet in Liferay Control Panel - most tabs seem to work fine - except Users and Groups, which should be disabled as we are using Liferay Portal to do that. Spring-Vaadin bridging for portal (see my previous post). Custom portlet applications and main Window class. The interesting detail here is that with Vaadin portlets, you should not set width of components to 100%, as it will result in 0px height. Generally speaking, the height in Vaadin portlet components should be set to undefined - null, or a preset value in pixels. More portlets! Reporting and Processes tabs need their respective portlets, but also "start process" portlet might be worth considering since we can manage UI contents in a more flexible way. More testing! If anyone is interested in testing Activiti portlets in Liferay, let me know and I will provide prebuilt applications. 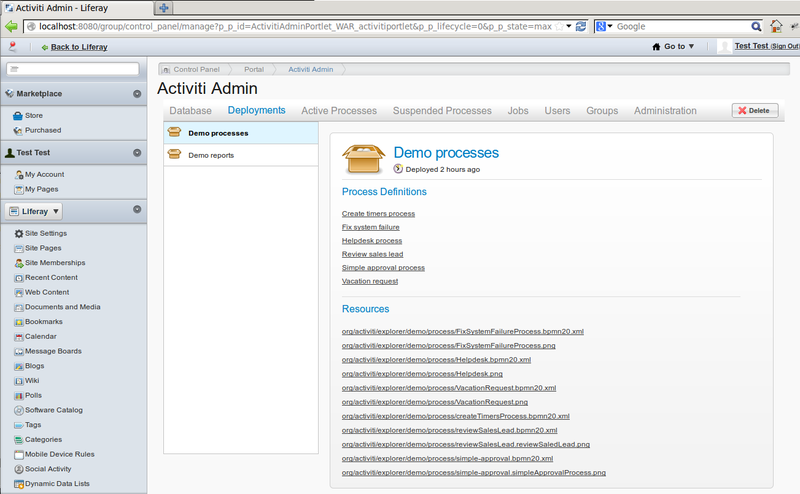 So far, I've used Liferay 6.1 GA2 CE and H2 in-memory database for Activiti. Friendly urls - especially for tasks resolved by id, and for interportlet communication - e.g. when starting a process. I want to add activiti explorer with in liferay itself. so how i can integrate it. Please refer to D:\gitRepo\Activiti\modules\activiti-engine\target\surefire-reports for the individual test results. Is there some war file available to deploy it directly into my liferay installation? Reinaud - the regression tests should pass correctly, have you checked what's in surefire-reports? You can always skip them with -Dtest.skip=true option to maven. After a successful build, a war file should appear in modules/activiti-portlets/target/. Thanks for your reply. You did a great job! But I'm now facing the problem that some of my liferay Groups are sites. I don't want them in the Activiti portlet. My question is where did you do the selection of the Groups? Well, please remember that this a PoC only rather than actual production-ready code. You can just add any customization over there.